This statement of the Lord Who guarantees the yoga-kshemam of the devotee has given rise to a great deal of misunderstanding. Even pundits, not to speak of others, have failed to grasp its real import. ananyâh -- having no other object; cintayantah -- concentrating; mâm -- on Me; ye -- those who; janâh -- persons; paryupâsate -- properly worship; teshâm -- of them; nitya -- always; abhiyuktânâm -- fixed in devotion; yoga -- requirements; kshemam -- protection; vahâmi -- carry; aham -- I. "But of those persons who concentrate on nothing else but Me and who are fixed in devotion in proper worship, I protect the union and to them I carry what they need"
The pundit was explaining enthusiastically the manysided implications of this sloka, but the Maharaja shook his head and said: "This meaning is not correct". He continued to dispute the correctness of every one of the explanations the pundit gave. The poor pundit had won meritorious distinctions at the court of many a Maharaja and was honored by them all with pompous titles. He felt as if he was stabbed when the Maharaja in the presence of the entire band of courtiers condemned his explanation of this sloka as 'wrong'. He smarted under the insult; but plucking up courage, he again set upon his task, and collecting all his scholarship, he plunged into an eloquent discourse on the multiple meaning of the words, "yoga"and "kshemam". The Maharaja did not approve of even this; he ordered: "Find out the meaning of this sloka and having understood it well, come to me again tomorrow". With this, the Maharaja rose from his throne and went into the inner apartments. The pundit lost even the few grains of courage left in him. He was weighed down by anxiety; he tottered under the insult, he reached home and, placing the copy of the Gîtâ aside, he fell on the cot. Surprised at this, the pundit's wife said, "Tell me why you came home from the palace today in such grief? What exactly did happen?" She rained one anxious question after another, so that the Pundit was obliged to describe to her all that had happened, the insults heaped on his head, the command with which the Maharaja had sent him home etc. The wife listened calmly to the account of what had happened and after pondering deeply over the incident, she said, "Yes, it is true. What the Maharaja said is right. The explanation you gave for that sloka is not the correct one. How could the Maharaja approve it? The fault is yours". At this, the pundit rose in anger from the cot, like a cobra whose tail is trodden hard. "What do you know, you silly woman? Am I inferior in intelligence to you? Do you, who are engaged in the kitchen all the time, cooking and serving, claim to know more than I? Shut your mouth and quit my presence", he roared. But the lady stood her ground; she replied, "Lord! Why do you fly into such a rage at a statement of mere truth? Repeat the sloka once again to yourself and ponder over its meaning. You will then arrive at the right answer yourself". Thus, by her soft words the wife brought calm into the mind of her husband. The pundit started analysing the meaning of each individual word in the sloka. ananyâs cintayanto mâm, he began, deliberately and slowly, repeating aloud the various meanings. The wife intervened and said, "What benefit is it to learn and expound the meanings of words? Tell me what your intention was, when you approached this Maharaja. What was the purpose? "At this, the pundit got wild. "Should I not run this family, this home? How am I to meet the cost of food and drink, of clothes and things, for you and all the rest? It is for the sake of these that I went to him, of course; or else, what business have I with him?" he shouted. The wife then replied. "If you had only understood what Lord Krishna has declared in this sloka, the urge to go to this Maharaja would not have arisen! If He is worshipped without any other thought, if one but surrenders to Him, if at all times the mind is fixed on Him, then the Lord has declared in this sloka that He would provide everything for the devotee. You have not done these three; you approach the Maharaja, believing that he would provide everything! That is where you have gone against the meaning of this verse. That is the reason why he did not accept your explanation". Hearing this, that reputed scholar sat a while, ruminating on her remarks; he realised his fault; he did not proceed to the palace the next day. Instead, he got immersed in the worship of Krishna at home. When the king inquired why the pundit had not appeared, courtiers said that he was staying at home and had not started out. The king sent a messenger, but the pundit declined to move out. He said, "There is no need for me to go to anyone; my Krishna will provide me with everything; He will bear my yoga-kshemam Himself. I suffered insult because I did not realise this so long, being blinded by eagerness to know the manifold meanings of mere words. Surrendering to Him, if I am ceaselessly engaged in worshipping Him, He will Himself provide me with all I need." When the messenger took this message to the palace, the Maharaja proceeded to the dwelling of the pundit, on foot; he fell at the feet of the pundit, saying "I thank you sincerely for explaining to me this day, out of your own experience, the meaning of the sloka which you expounded yesterday". Thus the king taught the pundit that any propagation of spiritual matters which does not come out of the crucible of experience is mere glitter and show. Listen to what happened to sage Ramadas of Bhadrachalam, the singer who was imprisoned by the Nawab of Golconda, for misappropriation of public funds (to renovate the Râma Temple at Bhadrachalam), whose liberation from jail was effected by Râma and Lakshmana themselves paying the Nawab the sum appropriated! Ramadas had piled up a large mass of palmyra leaves, on each of which he had written with his stylo a song on Râma. When his eyes fell on the heap one day, a thought struck him: "Did I compose these songs for my pleasure? Or, for pleasing Râma?" He wanted to know those songs which had pleased Râma, and fling away those which did not. He decided to throw the whole bundle into the Godavari River, and let Râma save those which He approved. Almost the whole lot sank in the depths; only 108 floated and were rescued. They alone had arisen from the heart; the rest smacked of cleverness, artificiality, punditry, pedantry. Prayers must emanate from the heart, where God resides and not from the head, where doctrines and doubts clash. There is the story of a rustic who sat among a gathering of devotees and listened to the exposition of the Gîtâ by a great pundit. All were wonder-struck by the scholarly commentry which the pundit gave and his learned disquisition on each word and phrase; and the rustic, though the exposition was very much over his head, seemed to attend very closely for he was all the time in tears! When at last the pundit asked him why he was weeping, he surprised everybody by the sincerety of his bhakti. For, he said that he wept at the predicament of the Lord, who had to sit at the head of the chariot and half turning His neck hold forth so long to convince the dull-witted Arjuna. "How much pain must He be suffering in His neck?" he asked and wept. That was real devotion, a sure passport to spiritual victory. He had identified himself with participants in the episode and the whole setting had become alive for him. Buddhi or intelligence exhibits greater discrimination than the senses and âtmâ exhibits greater discrimination than buddhi. In one village there were two beggars. One was blind and the other lame. The two of them became friends. The blind had his feet and the lame had his eyes. They came to an agreement. The lame man climbed on the back of the blind man and gave directions like a steering wheel. On going from one village to another, they came to a field of cucumbers. The blind one asked if there was a fence or wathman around and the lame man said there were none. The blind man then said that if the cucumbers were really good, no farmer would leave them like that in a field without a fence around or without a watchman. This meant that the cucumbers probably would be bitter to eat. The blind man could easily find out the truth of the matter because he had intelligence. This is the exercise of buddhi. The senses cannot determine the difference between good and bad. Buddhi can discriminate but not implement because it does not have the senses. There was a great bhakta once who failed in a test and so could not get the certificate. Every day at noon, he used to look out for a needy guest whom he could feed lavishly. Thus he spent years, but one day, a frail old figure toddled into the house and sat for the dinner. He had crossed the century mark in years. The host had the steadiness of the vow, but he did not have the discrimination to derive the fruit of that vow. Like water poured on a dry sand-bed, it did not add to its fertility. His heart still remained a dry sand-bed, though the waters of charity were poured on it every noon. The viveka-less heart drunk up the charity and he was the same strict ritualist. The decrepit guest was overwhelmed by hunger and so, as soon as the first dish was served he swallowed a big morsel without reciting the name of God. Annoyed at this atheism, the host cursed the old man and pushed him out of doors to starve or beg in the hot sun. That night, the host had a dream where the Lord chastised him for the cruelty of his behavior. The Lord said: "For more than a hundred years, I nourished that man lovingly as the apple of My Eye, though he never once took a single one of My many names. My dear man, could you not have suffered him for a few minutes?" I shall tell you what happened in a certain village. One section had specialised in acting the drama Lankadahana; but the other section decided to enact the play Harischandra instead. For the role of Chandramathi, the queen, they had to select a person from the Lankadahana group, because they had no alternative actor at all. The scenes were following one after the other. All went well until the prince died of a snake bite; then the mother refused to weep! The "son" belonged to the opposite group. So vengeance was taken on Chandramathi by Harischandra. He rained blows on her for being so callous; the drama sped along in another course, the course of hatred and faction. Thereupon, the Anjaneya (Hanumân) of the Lankadahana group brought things to a climax by jumping on the stage in his role with a tail burning at one end; and he set the theatre on fire to the delight of his henchmen and the consternation of his rivals. You must play either Harischandra or Lankadahana; it will end in a holocaust if you play both together on the same stage. Rather, prefer Harischandra and reject the playing with fire. Install truth in the shrine of your hearts and that will engender the wholesome habit of brotherliness among all men. Once Nârada was asked to name the most noteworthy among the things of the world. He answered that the Earth was the biggest. But, he was told Water has occupied three-fourths of the Earth; it threatens to swallow up the balance too, bit by bit. So, Water, he had to agree, was more powerful. However, Water too was drunk up by the sage Agastya and the oceans were rendered dry by him, and he, in turn, is now just a star in the sky! Is the sky the biggest, then? No, for, it was covered by one single foot of the Vâmana-avatâra [S.B. 8:20] of the Lord. And the Lord? O, He enters the hearts of the devotees and resides there. So, Nârada had to conclude that the hearts of bhaktas are the grandest things in creation! There was a thief who listened quite accidentally to the recital of the charms of Lord Krishna during childhood; he stopped for a moment, but could not pull himself away. He heard the description of the ornaments Krishna wore and got a great desire to rob those precious treasures. He asked the pundit where exactly Krishna would be tending the cows alone or with just His elder brother or with a handful of comrades. The pundit told him rather curtly "in Vrindâvana, on the Yamunâ bank". Planning to catch Krishna alone and deprive him of the ornaments, he hurried off to Vrindâvana. Sure enough, he met the Boy alone next morning at the head of His herd of cows .... but how could he take off the ornaments from that Loveliness? He was afraid that the removal of even one would reduce the Lustre and his heart did not allow him to do that. He looked on for hours, lost in ecstasy, till Krishna Himself asked him, but he was too ashamed to mention it. Krishna knew it however. He gave him all the jewels He wore. 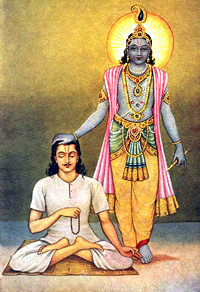 The thief was overcome with shame and joy: he fell at the Boy's Feet, but when he rose, Krishna was not to be seen. He came to his village and consulted the pundit. "Are these the jewels of Krishna that you extolled the other day? I went to Vrindâvana and He gave them to me". Needless to add, the pundit fell at the robber's feet. Faith can work wonders; it can compel the Lord to Manifest Himself and give you what you believe He will give. There was a king who led his mighty army across the snowy peaks that bounded his kingdom, into his neighbor's realm. On the lofty pass thick with snow, he saw a mendicant or ascetic sitting on a bare rock, with his head between his knees, evidently to protect it from the chilly wind that blew across the gap in the peak, He had no clothes on his body. The king was overcome with pity; he took off his own shawl and coat and offered them to the yogi (ascetic, one who has mastered the senses and the mind). The yogi refused to accept them, for, he said, "God has given enough clothing to guard me against heat and cold. He gives me all that I need. Please give these to some one who is poor". The king was surprised at these words. He asked him where that clothing was. The yogi replied, "God has Himself woven it for me; I am wearing it since birth and will wear it until the grave, here it is, my skin! Give that coat and shawl to some mendicant beggar, some poor man". The king smiled, for, who can be poorer than he, he thought. He asked him, "but, where can I find a poor man"? The yogi asked him, where he was going and why. The king said, "I am going into the realm of my enemy so that I can add his kingdom to my own". It was the yogi who smiled now. He said: "if you are not satisfied with the kingdom you have, and if you are prepared to sacrifice your life and lives of these thousands to get a few more square miles of land, certainly, you are much poorer than I. So, offer the clothes to yourself. You need them more than I do". At this the king was greatly ashamed; he realised the futility of fame and fortune and returned to his own capital, thanking the yogi for opening his eyes to his innate poverty. He now understood that contentment is the most precious treasure. Great men spread the light of their wisdom through every word and deed of theirs. Once there was a hunter who had captured a baby bear and brought it up as his pet with great love and care. The bear too reciprocated his love and behaved like a good friend for many years. One day when he was traversing the jungle with his pet, who had grown up into a lusty beast, he felt overcome by sleep, so he laid himself down on the grass asking the bear to see that he is not disturbed. The bear kept watch very vigilantly. It noticed a fly that flew round and round and settled on the nose of the master. The fly went off when the bear waved its thick heavy hand; but it came again, and settled on the nose. The bear got enraged when repeated waves of the hand did not teach the fly the lesson that his master's nose was not the fly's resting place. At last the bear could not bear the insolence any longer. His heavy palm came down with a thump on the nose, a devastating whack! The master died on the spot! That is the consequence of keeping company with the wild and the foolish. However affectionate they are, their ignorance will land you into disaster. Resist the temptation to satisfy the senses, to acquire what the world can give, to accumulate material gains. Set limits to your wants. There was a pupil once, in the kingdom of Raghu, who asked his preceptor at the conclusion of his studies, what dakshina he will accept from him. Dakshina means offering made in gratitude for service rendered. The Guru told him that he needed no other dakshina than his gratitude; it was enough if he lived according to his teachings and brought honor to his preceptor thereby. But the pupil insisted that he must indicate his need and tell him some sum of money or gifts that he would accept. So just to ward him off and get rid of him, the Guru named an impossible sum of money: "You learnt sixteen Vidyâs (knowledge of soul or of spiritual truth) from me, well, bring me sixteen lakhs of gold nishkas (coins)". At this, the pupil went off, to collect the sum. He went to Emperor Raghu, and got from him the promise that he will fulfil his every desire. Then he placed his petition for sixteen lakhs of gold nishkas before him. Emperor Raghu was rendered desperate by the vast sum needed, though an Emperor, he was too deep in austerity to have the sum on hand. Still, in order to keep his plighted word, he invaded the realm of Kuvera, the God of wealth, and brought back as booty enormous stocks of gold. "Take all this, and give your Preceptor what he has asked for, keep the balance for yourself", the king said. But, the pupil refused to take a coin more than what he had to offer as dakshina to his Guru. "I have brought them for you, it is all yours, take", insisted Rahgu. But, the young man resisted the temptation and stood his ground. That is real heroism. 'Asanthushtah dvijonashtah' - the discontented man is as bad as lost. Rely on the Lord and accept whatever is your lot, He is in you, with you. He knows best what to give and when. He is full of Prema. I am reminded now of past events, events in My previous body. Even then, I had sathya or truth as My support. A wrestler challenged Me then for a fight and he was defeated before a large gathering of villagers. Pained by the insult, he invited Baba for a second tussle the next day, so that he might win back his lost reputation. The man swore that if defeated again, he would wear a long rough kafni and move about with his head covered in cloth. He dared Baba too to swear likewise. Baba was in no mood to enter the arena again and he was quite prepared to concede the fellow the victory he craved. So he accepted defeat and himself donned the kafni and the kerchief. The wrestler felt great remorse and his insolence melted away. He appealed to Baba to resume his usual style of dress and released him from the obligation. But Baba stuck to his word. He was Sathya Itself. He wore the new attire. Durvasa was a reputed Vedic scholar; he had the music of the Sâma-Veda on his tongue and the cinders of anger in his eye, strange combination, indeed. Seeing this absurdity, Sarasvatî, the Goddess of education and scholarship (eternal companion of Lord Brahmâ), laughed in derision. The sage was stung to the quick; he threw a curse on Her and she was born on earth as the daughter of Atreya. There was a brother too, a feeble minded chap, incapable, in spite of the efforts of skilled teachers, of even pronouncing the Veda aright. He was beaten with a rod, but that only made him weep helplessly. Sarasvatî was moved with great pity. She intervened and saved him from physical torture. She taught him the four Vedas and the six S'âstras and he became a great master. Meanwhile, the Veda had faded from human memory and, as a result, famine stalked the land. Rishis were reduced to skeletons. They yearned for the Veda, for that was the sustenance on which they lived. 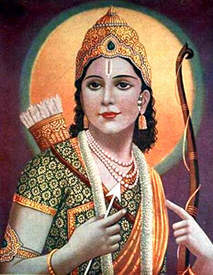 Sarasvata, the brother of Sarasvatî, prayed to Candra (demigod representing the order of the moon). She made the earth sprout forth edible plants or Sâka, on which the rishis decided to live. Sarasvata taught them the sixty different sections of the Vedas, but so thick was the fog that had descended on the Vedas that the sages who learnt them from him were confounded by cynical critics. Nârada had to assure them that what they had learnt was the genuine Veda iself, but even he could not remove the stain of doubt. They jointly approached Lord Brahmâ. He said, "You were all able to get this vision of me as a result of your vedic study; you can yourself become Brahmâ when you practise what you have studied." That was how Sarasvata Mahârishi revived the Vedas once in the past. Respect or disrespect which others give has no meaning. These are simply words. There is a small story to illustrate this. In a village, there were two individuals. One of them always used a horse for making his journeys. The second individual would make all his journeys by walking with a pillow in his hand. One day, both of them had to start for the same village at the same time. On that occasion, the man who was accustomed to carry the pillow led the way. Behind him was the person travelling on horseback. On the way, there was another small village through which both these persons passed. The villagers looked at the individual carrying the pillow and thought that he was a peon, carrying the papers, ahead of the master coming behind. They looked at the man on horseback and they thought that he was the officer. In early days, because there were no cars, all the officers used to make their journeys on horseback. That is why the villagers thought that way. As soon as they reached the destination, the man with the pillow went straight into a rest-house and sat in a comfortable and boastful manner, resting himself on the pillow. The other was looking around for a place to tie up his horse. The villagers looked at both of them and thought that the man with the pillow was the officer and the man trying to tie up the horse was the peon. This is how respect and disrespect take shape in the world. The person who was thought to be peon in the former village was thought to be the officer in the latter village. This is only imagination on the part of the onlookers and flows from the minds of people. In this process neither respect nor disrespect has come to either of them as a result of intrinsic worth. There is a small story with regard to Ramakrishna Paramahamsa. In the midst of giving a discourse, he found a disciple by name Rani Rasamani sitting and pretending to listen to the discourse. He went straight to her and gave the Rani two slaps. Others who were witnessing this event were surprised and were thinking that Ramakrishna dit not have a sound mind. Rasamani also was surprised at this and was trying to think if anything was wrong with her and why the guru was treating her with disrespect. Truly, if one knows one's own faults, he will not commit those faults. In fact, because Rasamani did not know her fault she was not able to realise what was wrong with her. Ramakrishna told her that if she came there to think of her problems of litigation, and not to listen to the discourse, she might as well do so in her house. In the same manner, some people who come and sit here to listen to what is being said here waver and flutter like the leaves of a tree. They move about and look around as if they are crows. They are not able to sit steadily. They look this side and that side. They are unconcerned and unaffected by all that happens here. They can not even sit properly. Unless you have a steay mind, you cannot understand matters relating to the âtmâ. They also set a bad example to others. People who have a wavering mind cannot be true yogis, even though they may pass off as good devotees in external appearances. There was a judge who used to come to Shirdi; he asked his wife and child to stay with Baba and left to go home for a couiple of days. He said to the boy when he took leave, "This is God Himself". After some days the mother left for Manmad with the boy. There, they fell in with a kathak who was reciting musically some Purânic story. Within a few minutes, they heard him revile Sai Baba as a mad man and a cheat; the child could not stand it any longer. He tugged at the sari of his mother and forced her to return to Baba. Next morning, they approached Baba for His blessings and He asked them why they had returned. The incident of the kathak was duly reported. The boy heard every one addressing Baba as the Lord. Remembering the harsh words of the kathak, the boy wept, But Baba pacified Him humorously, "I am only a man. What the kathak said is true; I am mad and I am cheating people of what they consider very valuable, but what I feel is useless". Then, even as they were talking, one Mr. Patel came there and related how Baba had saved his child from a serious accident. Baba told him, "Yes, I held him when he fell, with My Four Hands". 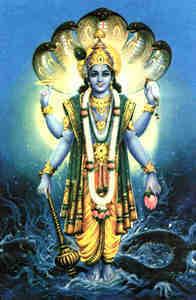 Patel shed tears of thankfulness, but the boy cried out, "Ah, I told you, You are God, You have four hands like Vishnu". Baba laughed, He took the boy inside and gave him a vision of Himself, as having Four Hands. That boy stayed on in Shirdi for 26 years after this and left only after Baba 'left'. He then took sannyâsa and became a great sage. To conquer egoism, no rigorous system of exercise or breath control is necessary. No, not even complicated scholarship. The gopikas confirm this truth. They were simple rural folk, untouched by the conclusions of deep study. Nârada was once so shocked at their ignorance of the science of spiritual progress that he volunteered to go among them and put them through some lessons in jñâna. He found, on entry into Vrindâvana, that the cowherd girls selling milk or curds in the streets forgot to shout the names of their ware but said: "Govinda, Nârâyana", instead, so immersed were they in God-consciousness. They did not know that they had sold off all the milk; they still wandered on, calling out the names of the Lord for the dust of Vrindâvana was so sacred for them. They had no vishaya-vasana, no wish for sensual pleasure; and so, they had no a-jñâna. Hence, Nârada concluded that they had no need for the lessons he had planned to give. He prayed to them to teach him the means of getting that yearning and that vision of the all-pervading Krishna. There was a gopî, for example, called Saguna, who had no other thought than those related to Krishna. Now, every evening, it was the usual routine in Vrindâvana for every house-wife, to light the lamp from the flame of the lamp at the house of Nanda; they believed that getting light from the flame of the eldest and highest is auspicious. Saguna went with the lamp to Nanda's house and when she reached the house, her mind was lost in the thrill and joy of seeing the very house, where Krishna spent His childhood days, to which His pranks and prattle drew all the cowherd boys and girls. She stood there with her unlighted lamp for a long while, near the big oil lamp illumining the central hall. She was holding the lamp near the flame, but not near enough. She had her finger right over the flame. She was not aware that her finger was being scorched by the flame; she was too full of Krishna-consciousness to be aware of the pain. It was Yas'odâ who saw her plight and woke her from the reverie, or shall we say, 'vision'? For, to her, the house was alive with Krishna wherever her eyes turned. That is the thanmayathvam or identification one must achieve. There is no use if the fledgeling stays in the nest; it should develop wings and fly into the sky. There is no use if man grovels in the dust; he should see the distant goal, clear and grand; he should take to his wings and fly. There are subtle influences that pass into food from the persons who prepare it and handle it and are absorbed by those who eat it. Food is the basis of character. The state of the mind is conditioned by that of the body. I shall tell you now of an incident that happened eighty years ago. There was a great yogi, Hamsaraj by name, at Badrinath. He was always immersed in singing the glory of the Lord. He had a disciple who was equally earnest and sincere. That young man was pestered by a dream for a few days which gave him no peace. In his dream he saw a fair young girl of sixteen weeping in great agony and calling out pathetically, can no one save me? The disciple was amazed at this strange dream; he could not shake off that doleful figure and that desperate cry from his mind. He recited his woes to the Master. Hamsaraj, I can assure you, was a true Hamsa, the Bird of Paradise. The bird can discard water from milk, is it not? Hamsaraj, by his viveka, analysed the situation and discovered the cause of that horrid experience. He prodded the young man with such questions as: "What did you do the first day?" - "Where did you go?" - "What did you eat?" etc. It was revealed that he had gone with a friend to a feast and eaten some puris and chapatis. It was discovered that a poor brahmin had prepared the feast. Well, Hamsaraj sent the disciple to find out why and with what resources that brahmin arranged the feast for the recluses of Badrinath. The young man cursed the day when the dream started haunting him, for he was now being sent by his Master on purposeless errands to investigate irrelevant issues; he wondered how his sâdhana could be helped by all this. Nevertheless, he went and pursued the enquiry about the feast and its origins and the wherewithal out of which it was prepared. It came to light that the funds were supplied by a sixty-year old moneylender to whom a brahmin had given his daughter in marriage and received in return a sum of ten thousand rupees. She was now appealing to the holy men for a bit of human kindness towards a forsaken child. Hamsaraj thus demonstrated to his disciple that one should examine the source of the food, the motives for the gift and passions that surge and sway the giver before accepting such an intimate gift as food. Bhagavad Gîtâ: the song of God. The discourse of Krishna about devotion and yoga taken from the epic the Mahâbhârat (see also the Uddhava Gîtâ, the chapters seven to twenty-nine of the eleventh Canto of the S.B. that make up an alternative Gîtâ wherein Krishna explains how to live His love in His absence). Sâma-Veda: One of the four original Vedas. The Sâma-Veda consists of the musical compositions of the hymns. Kathak is among the six major classical dances of India and one of the most dynamic theater arts in the world. The word Kathak is derived from katha, meaning "the art of storytelling." It is also synonymous with the community of artists known as Kathakas whose hereditary profession it was to narrate history while entertaining. With dance, music and mime these storytellers of ancient India would bring to life the great scriptures and epic so ancient times, especially the great Indian epics the Mahâbhârata and the Ramâyana and the Purânas of Sanskrit literature. Hamsa: The swan as a spiritual model of discrimination for its ability to separate milk from water with its beak (see also paramahamsa). Paramahamsa: (from parama: supreme, and hamsa: swan) the most elevated of all the self-realized, or someone who like a swan, a hamsa, who knows to extract milk from a mixture of milk and water, is capable of seeing the Lord only in all circumstances, in whom he is completely absorbed. Viveka: Intelligent discrimination. The capacity to reason and see things in proper proportion. Discrimination between the real and unreal, between the permanent and the not, between the beneficial and the not, between truth and falsehood.